Overhead picture of SEPTA Regional Rail train arriving at Market East Station, 11th and Market Streets. 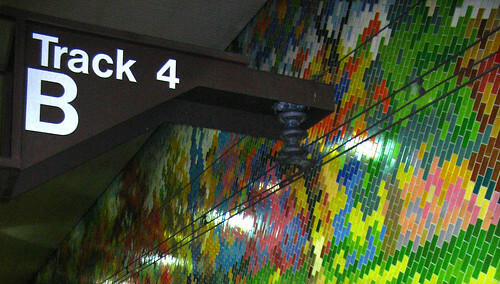 Note the brightly-colored mosaics on the tunnel walls - if you're new to the train, they indicate specifically that you have arrived at 11th and Market Streets. Located at 11th and Market Streets, Market East Station is the closest SEPTA Regional Rail station (i.e., "train station") to the many historic attractions, museums, and nightlife in Old City Philadelphia. It also is very close to the Reading Terminal Market and the Pennsylvania Convention Center. Finally, Market East is also the western bookend of The Gallery at Market East, an underground, convenient, pedestrian shopping mall that runs for about three to four blocks. Generally known as just "The Gallery" by Philadelphians, the shopping mall travels from Market East in the west, to the old and sadly closed Strawbridge and Clothier department store, at 8th and Market Streets. Granted, while Market East is the closest train station to Old City, it is not located in its midst, unfortunately. When you disembark from your SEPTA Regional Rail train at 11th and Market Streets, you have a few blocks to walk to reach the unofficial borders of Old City Philadelphia. That border is generally considered to begin at 6th Street, where the Independence Visitor Center is located. From 6th, Old City extends east over to to Front Street (the equivalent of "1st Street"), and Penn's Landing. There are numerous ways to enter and leave Market East Station. By far, the most eye-pleasing and aesthetic way of entering and leaving, is traveling through the gleaming, renovated Reading Terminal Headhouse, located on the corner of 12th and Market Streets. You will walk into a beautiful vestibule, with the fascinating history of the Reading Terminal on modern kiosks. (And a Dunkin’ Donuts, if you’re hungry.) In order to get to the train platforms, there is an escalator that takes you up or down. While on the escalator, you will see a vivid mural, a nostalgic ode to the train travel days of yore. However, the one chief virtue of this entrance, is that it is a little faster to the platform, as you take a more direct route. The later it is at night, the greater our recommendation is, that you enter or leave Market East Station via the Reading Terminal Façade on 12th Street. There will be a handsome, black, tall clock on the corner, in front of the door - which is very useful if you are trying to make a train. In addition to the more pleasant aesthetics, it is also safer than the 11th Street entrance. There's a security desk that is often manned, and it's much better lit, better signed for visitors, and less desolate than the 11th Street entrance. So, trust us - even if it means you have to walk a little further - go in via 12th Street. Especially, if it's late at night. 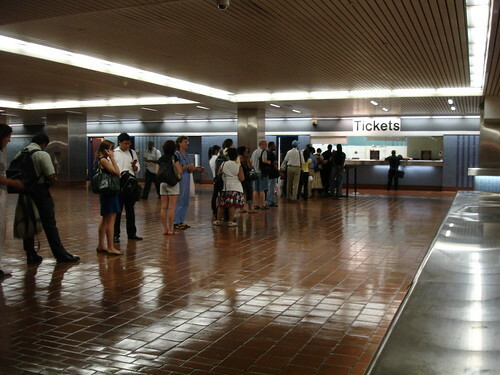 Rush hour line for tickets at Market East Station. To see a larger version of this photo, just click on it. We'd highly recommend that you go to our approximate Travel Times to Market East Station page. Track and section sign, Market East Station. To see a larger version of this photo, just click on it. It’s vital that you know the correct Track (a number) and Section (A-B), upon which your selected train will be arriving. If you aren’t on the proper platform when the train arrives, you probably will not have time to figure it out, get down to the platform, and on the train, before it leaves Market East Station. Although we hold out hope that the previous colors and R-designations will be restored, SEPTA has officially abolished them, now. The geographical name - to illustrate, Paoli/Thorndale - of your train line, is now the only piece of information upon which you can rely. The colors and R-designations are no longer there, either on the monitors or the schedules. This fact is of particular importance: by definition, the track you arrived on will not be the same track, you will leave from. You traveled to Philadelphia, on an inbound train; the outbound trains, traveling from Philadelphia, use different platforms. So look to see what track and section your outbound, returning train will be using – it will be the same color, but will have a different destination, naturally! And remember the track and section, so that once you’re in the train station, you can go directly to the platform, without needing to figure it out. But if you can only remember one thing, make sure it’s the track. If you have the wrong section, there are only two of those – A and B – and you can correct that error much more quickly, just by walking up or down the platform. In contrast, if you get the track wrong, you have to go all the way back up the steps, go to the correct track, and go down the stairs again – and odds are, if you need to take those additional steps, your train will be gone from Market East - without you on it. Particularly if you are traveling at rush hour, watch for the lights for an incoming train to reflect along the mosaic wall. You are more likely to get a seat, if you are standing on the platform and ready to board, when it arrives, than you are if you are at the back of the line. SEPTA also has electronic signs on the platform, noting which trains are due in for the particular track. If your train is running behind schedule (which happens, sometimes), it will let you know via the sign. To reach Old City from Market East, you have several options, once you disembark. Each has its own advantages and drawbacks. If you already have a specific destination or destinations in mind, you can consult our guide - How To Get From Market East Station to Old City Philadelphia Attractions. Here, in this section, we lay out the basic advantages and disadvantages, for each method of getting to Old City, regardless of the destination. Advantages: This is free, does not require much planning, and provides an opportunity to see more of Center City. Drawbacks: If you're headed to Penn's Landing, or one of the low-numbered streets, it's a very long walk, and even if you don't mind the walk, it takes a long time. Especially if it's hot and/or humid, or raining, or snowing. The purple Phlash Trolley is often your best bet for traveling around Center City Philadelphia, particularly if you're from out of town. Advantages: All of those on foot, with the limited exception of not being free. But for $2/person (and $5 for an all-day pass, $10 for a family), we believe it's your best bet. It's also much faster than going on foot, and far more pleasant than walking in extreme heat or cold. Drawbacks: The Phlash doesn't run at night, although we certainly wish that it did. It only runs from 10 AM to 6 PM, or so. Even worse, the Phlash doesn't even operate all year. It only runs from the beginning of May, through Halloween - the peak season for visitors, both locals and travelers. The Blue Line/Market-Frankford Line/"The El"
The SEPTA Blue Line - which is known officially as the "Market-Frankford Line", and unofficially as "the el" - directly connects with Market East Station. Advantages: The el is air-conditioned (if you're a local who hasn't been in Center City for a while, it received air-conditioning many years ago). Being a high-speed subway in Center City Philadelphia, it is even faster than the Phlash, and makes stops at 8th Street, 5th Street, and 2nd Street, all of which are convenient for the sightseer. From Market East, you can get on the el most conveniently at 11th Street. Just follow the signs when you come up from the train tracks, for the Market-Frankford Line. They'll take you directly to 11th Street. In Center City, the el stops at 15th, 13th, 11th, 8th, 5th, and 2nd Streets. Drawbacks: You really need to get tokens, involving a trip to the SEPTA sales window. Tokens are both easier to use, and less expensive, than paying in cash, and they speed you through the turnstiles more quickly. Tokens are also safer, especially if you're from out-of-town - you look much more like a local, with tokens. El service can take a while, especially on nights, weekends (that is, when you're most likely to be there), as well as during midday hours during the week. The best time to be traveling via the El to or from Old City is in the late afternoon, when service is more rapid. Make sure that you pay attention and not go ANY further eastbound, than 2nd Street/Olde City. Otherwise, you will have to get off at the next stop, Spring Garden, which is relatively far (you can't just walk back). It will cost you a lot of time, another token, and you'll also have to go down the stairs, and back up them (since Spring Garden is the first elevated stop), and that's a complicated hassle. And we'd prefer that you not have to do something that complicated. Instead, we'd rather see you enjoying Philadelphia. In summary, it's easier, cheaper, and more efficient just to pay attention. Don't go past 2nd. That el's really fast, a lot faster than the Regional Rail trains. It only takes a minute or two to bounce from stop to stop. If you get on at 11th, you'll be at 2nd very quickly, probably a lot more quickly than you thought. So you can miss it. Don't let it happen to you. There are many buses crawling up and down Market Street, particularly during the day. You can just hop on any eastbound bus (i.e., going to Penn's Landing), and then just ride to wherever you might want to go, in Old City. Advantages: You don't have to descend into the complicated El system, and there's much less of a risk that you'll accidentally overshoot 2nd Street. Since there are so many bus lines, they're easier to grab than the El, and so if you're there during the middle of the day, it would be faster for you just to jump on an eastbound bus, than to go down and wait 10 (or 15) minutes for the next El train. Also, since they're visible on the surface, you can emerge at 11th, glance back down Market Street to City Hall to see if a bus is coming, and then decide to board it. Drawbacks: Like the el, the buses run far less frequently at night and on the weekends. Also, they're slower than the El, naturally, since they have to deal with lights. "Lumbering" would be the best verb to use for what SEPTA buses do on Market, especially during the day, as they stop at nearly every block. Bottom line: You're probably better off, not waiting for a bus to appear. If you don't see one coming, you're probably better off just getting on the el, since by the time one gets there, an el train will already have gotten you there, with its superior speed. Also, like the el, you need tokens, and for the same reasons. Cabs are plentiful everywhere at Market East Station, even at night, as the Pennsylvania Convention Center and Marriott Hotel are across the street. Advantages: By definition, the cab will get you exactly where you want to go in Old City. Equally by definition, the Phlash will only take you to one of its 27 stops, the el will only take you to 8th, 5th, or 2nd and Market Streets, and the buses will only take you to various points on Market Street, up to Penn's Landing. To illustrate, you may be heading somewhere on a tree street (Chestnut, Walnut, Locust, Pine), and you'd have to walk once you got off public transportation. The cab will take you directly there, in contrast. You don't need tokens, just cash. And the climate control is perfect. It's also not a particularly expensive cab ride, as Old City is very compact. We generally would recommend the cab, if you are going out to sample the nightlife in Old City. As noted above, the buses and el run far less frequently at night, and the Phlash doesn't run at all, even from May to October. Also, if you're going out, you may have a group that can split its fare, the cab (or two cabs) may be the way to go. A good rule of thumb - the larger your group, the better off you are with the cab. If you have four or five people, the cab would actually be cheaper than the SEPTA tokens, and it provides a much better and efficient service. Drawbacks: Well, there's always the cost of the fare. The only other drawback is traffic. If you are traveling at rush hour, the El - which doesn't have to stop at lights - will be faster than a cab, especially if you're trying to get somewhere on Market or Chestnut Streets. If you'd like to return to the SEPTA Regional Rail Guide, please click here.